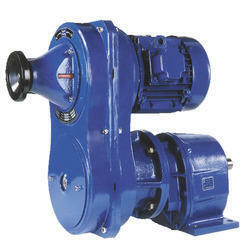 Manufacturer of a wide range of products which include variable speed geared motor. Variable Speed Geared Motor offered by us provides high efficiency working support and is made using latest technology to provide reliable work performance. Further, these geared motors also provide support for smooth operations as well as low noise performance. Offered products are manufactured from high grade cast iron and designed for maximum heat dissipation. Variable Speed Geared Motor is a complete variable speed drive delivering the required variable speed range, torque and power. Speed variation ratio of 1:7. This unit is a variable speed geared drive, consisting of Electric Motor, Fixed Centre Drive pulleys, Belt, Casings, Bearing Housing and a Reduction Gearbox. Flexibility in supply – We can select and assemble the drive for you depending upon your power, torque and speed requirements. If you have the Motor and Gearbox we can assemble the unit for you. We supply you the variable drive, casings, belt, control mechanism and bearing housing you assemble the unit as per our instructions. Flexible to suit your needs and requirement. Available for power rating from 0.75 Kw to 7.5 Kw.